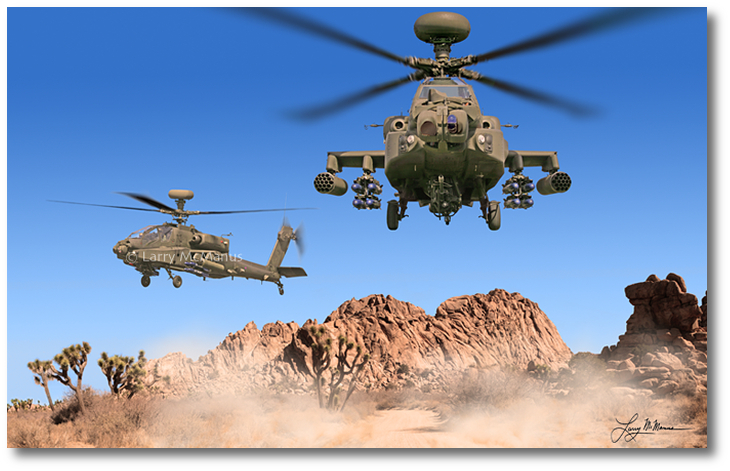 Image Size: 44" x 29"
The Apache Longbow is a twin-engined Army attack helicopter developed by McDonnell Douglas (now Boeing). It entered service with the US Army in 1984 and has been exported to Egypt, Greece, Israel, the Netherlands, Japan, Saudi Arabia, United Arab Emirates (UAE) and the UK. The US Army has more than 800 Apaches in service, and more than 1,000 have been exported. The Apache was first used in combat in 1989 in the US military action in Panama. 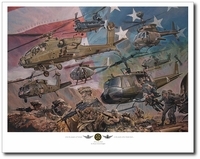 It was used in Operation Desert Storm and has supported low intensity and peacekeeping operations worldwide including Turkey, Bosnia and Kosovo.